I wanted to make a card for a friend who is having major surgery tomorrow, so I decided to have a go at the Butterfly Challenge for this fortnight, which is to use a butterfly of course, but also to use 'M' is for Margins and/or Mint. I love the colour mint and it just so happens that I have a fairly ancient versacolour ink pad called Mint, and also a Brilliance Pearlescent jade pad which is almost identical but with a sheen, so I was off to a good start. (These ink pads amaze me. They really are years old but they still work perfectly). I do like making square cards, and when I was in UK earlier this year I bought a 12" x 12" pad of white card, so it is easy to cut a sheet in half and make two 6" square cards (or 15cm as I prefer to call it these days!). I took a slightly smaller piece of white card from my eternal stash of white snippets and stamped it with my much loved, Impression Obsession Cover-a-card stamp, using the versacolour ink pad. My margins were made from snippets rescued from a brochure from a well known High Street bank, which have been in my snippets box for ever. (We don't even bank with them any more!). I edged them with a Marianne border punch, and when they were attached to the card, I laced them together with mint embroidery thread. The tails of the thread were used to tie on a tag made from more snippets of the card and a Hot off the press sentiment stamp. I wanted to add another colour so I used Memento ink pads, Pink blush and Rose bud, and my Altnew layered rose stamps, and the corresponding dies, and made three roses. - I love these stamps. There are three or four stamps for each flower which you use with increasingly pale ink and it gives a lovely result. The Misti stamp positioner is a great help when doing this. The leaves were also cut with the Altnew die, from pieces of darker card from the same bank brochure, but they were too shiny to stamp on so I used a permanent marker to add a few lines. I rubbed a small off-cut of white card with the Brilliance ink pad, to completely cover it, and when it was dry I punched out some tiny butterflies using X-cut and Marianne punches, and glued these randomly over the card and tag. To me the card looked a bit 'unbalanced', and being a Libran, I didn't like this, so I rummaged through some boxes and found a green and blue butterfly on a cheap sheet of stickers from our todo shop. Putting this in the top right hand corner balanced it up for me. 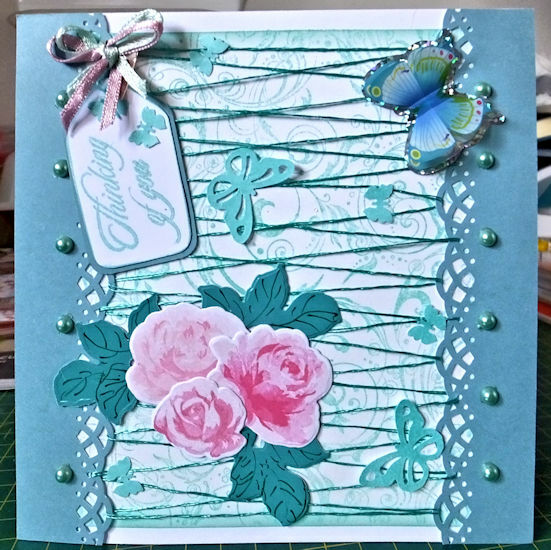 Then a few flat-back mint pearls gave the margins a lift and with the addition of a tiny pink and mint bow, my card was complete. So I will link this up with Mrs A's Butterfly Challenge#51, and then, as I haven't been to play for a while, I will also take it over to Pixie's Snippets Playground, and see what my crafting friends have been up to. 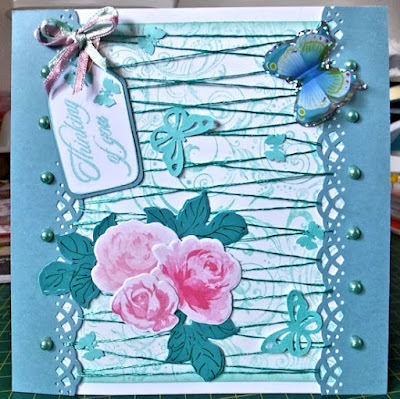 This is very pretty Kate, the stamped roses are lovely and I really like the die cut margins as well. The lacing is a clever idea too. What a brilliant idea to make the lacing between the two borders. It looks very elegant. Love the stamped roses. The 3d butterfly and the little tag are perfect additions. I hope your friends operation is a success. This card will cheer her up. Thankyoy for fluttering by my challenge where your card will be entered into the draw twice. Hugs Mrs A. What a pretty card Kate - love that lacing, it is so eye catching and 'different'. Hi Kate - how lovely to see you in the Playground! We miss you but understand that priorities and favourite crafts change. This is such a stunning card - really clever to add the lacing and I so agree about the ink pads - some of my oldest Brilliance ones (just little cats eyes shape/sizes) are still going strong - long after TH Distress ones need re-inking. I guess his are water based so dry out faster?! Very innovative card Kate. Hope your friend's op goes well. Gorgeous card Kate, I'm sure your friend will love it.